Why Peru Should Be at the Top of Your Bucket List. For traveling internationally, flights to Peru are pretty affordable. We bought our tickets roundtrip to Lima for $641.34 through Delta. View above the Andes Mountains. We are both members of the Delta's Skymiles program and American Express card so the two of us try to fly this airline as much as possible. Even now, I'm seeing flights go for $550-$850. The flight is seriously a breeze: I had 2 (maybe 3) glasses of wine, a meal and 2 movies and we were there. Peru holds one of the 7 Wonders of the Modern World- Machu Picchu. Machu Picchu is seriously one of the most impressive things you'll see in your life, between the stunning 360° view, the mountains and the fact that it's an ancient city that was built at almost 8,000' above sea level (that's high). Our first sighting of Machu Picchu. We arrived at 9:00AM with fog and a little rain. By 11:00AM the fog rose revealing the mountain, Huanya Piccu. Putting aside the obvious reasons of why it's important to go see this marvel, I want to tell you about the biggest challenge of Machu Picchu: getting there. 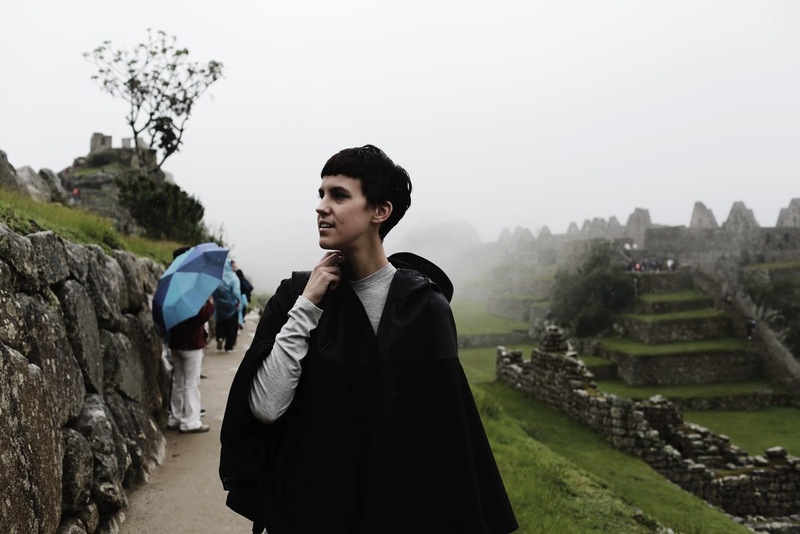 The closest city with an airport is Cusco. Cusco is a historic Peruvian town which can be very sleepy/BnB or an absolute party town - depending on what you're looking to do. Since we didn't have a lot of time there, we chose the sleepy route also because it takes a while to adjust to the altitude. Cusco sits at a little higher than 11,000' above sea level (it's really high) and altitude sickness is pretty real at that height. Luckily there are a few Peruvian remedies, one of those being there Coca tea, which was pretty satisfying and I felt like it actually helped. So once you make it to Cusco it's important to at least give yourself a day to get used tot he altitude before you do anything that requires any physical exertion, like going to Machu Picchu. 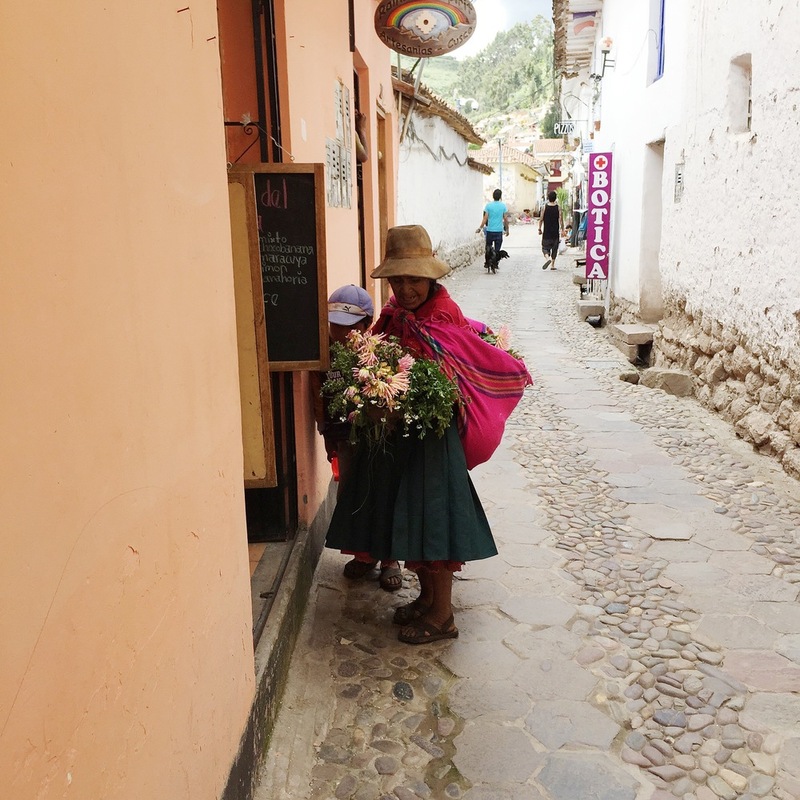 The day we went to Machu Picchu, we woke up at 4AM and took a 1.5 hour bus ride through the mountains and 2 towns to get to the train station in Ollantaytambo. We then boarded the train which completely surpassed my expectations and was maybe one of my favorite parts of the experience. 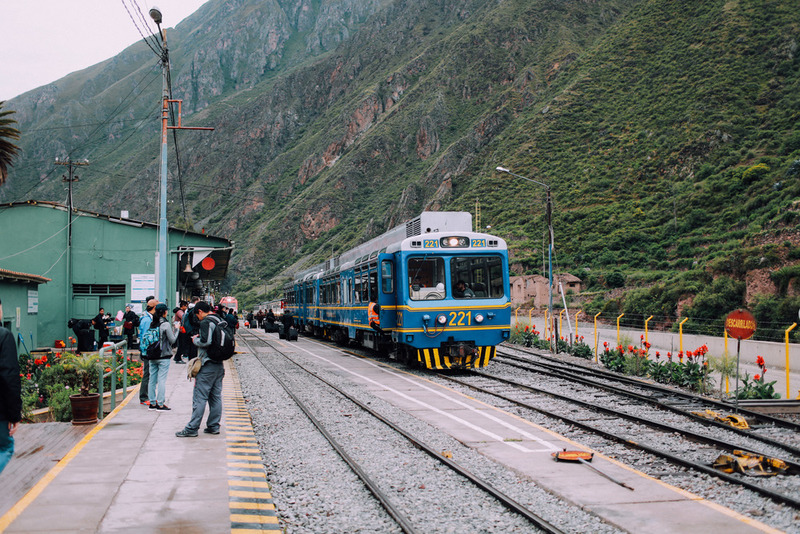 The train was about 1.5 hours and dropped us off at the town of Aguas Calientes (hot springs) and then from there we took a winding 20 minute bus ride to the gates of Machu Picchu. We're not typically guided-tour people, but we decided to take the guided-tour. This ended up being an excellent move, because there are no plaques or signs that say what everything is, so if you want to know what anything is I would suggest the tour which lasts a little over an hour. Once the tour was over you have plenty of time to take pictures and are free to explore. Truly an amazing experience. Now there are 3 ways you can get to Machu Picchu: The way I listed above would be the first. 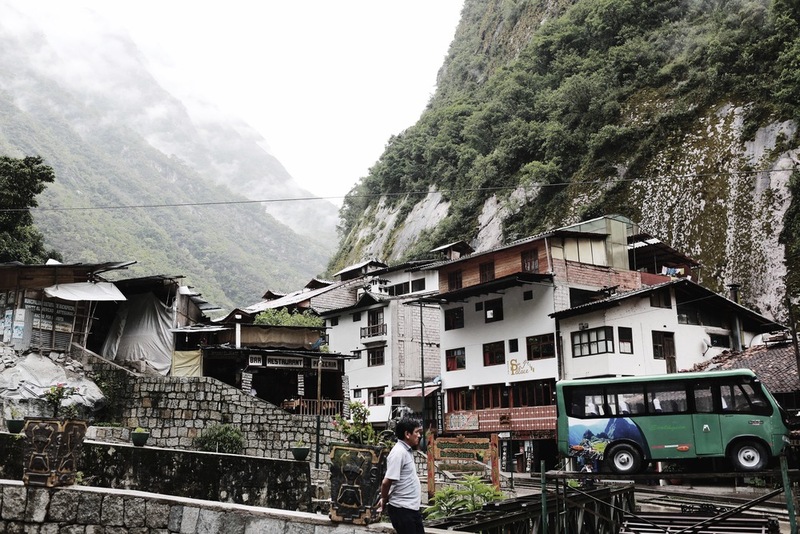 The second is to take the Train to Aguas Calientes, but then skip the final bus ride and walk up the hundreds of steps to the top of the mountain (this could take anywhere from 1.5-3 hours to climb). If you have the time and don't mind hiking, there is a 10-day hiking trek that leaves from Cusco and ends at Machu Picchu, called the Inca Trail. Honestly, if we had the time I would have loved to have done that, but time wasn't in our favor. I can only imagine how amazing it would be to be rewarded with the absolute beauty of climbing that last step after a 10-day hike to finally see Machu Piccu... ahhhh. After having a blast in Cusco, we flew back to Lima to finish out our trip in the Miraflores District of Lima. Which absolutely gorgeous. 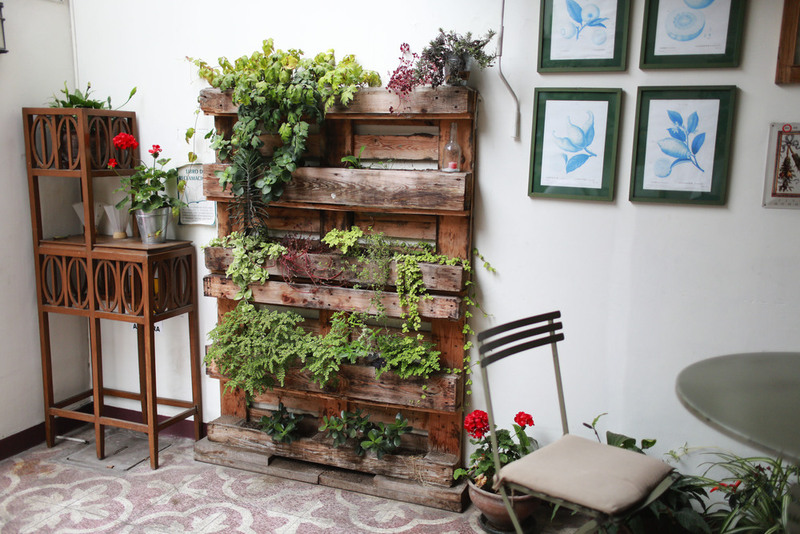 I could talk all day about Lima, but I really want to tell you about the BEAUTIFUL boutique hotel we stayed in, Quinta Miraflores. As we approached the hotel we quickly realized what a beautiful area we were in, which was further amplified by the absolute charm of this quaint, perfectly decorated hotel. We walked through the white picket fence up to the front door, knocked, and were instantly greeted by the friendliest staff you'll ever meet. We quickly got the key to our room and made our way up the stairs. Now let me say this, if you like sterile IKEA'esque furnished hotels, this is not that (That's what makes this hotel BETTER!). The interior design of the room is incredible, the furnishing of the bedroom had a ton of character with a warm vintage feel - everything just tied together so perfectly. And don't get us started on the bathroom. As soon as you enter, you see the most beautiful clawfoot bathtub, that feels more like a piece of art or statute than a functioning bathtub (it did however also function as a proper bathtub). After spending the day eating and drinking like royalty at the many wonderful restaurants the area has to offer, we came back to our room, filled out our complimentary breakfast form and went to bed. The next morning we had breakfast in the garden which was lovely. The owner (Barbara) who was stopping by, sat down with us, had a coffee and gave us the history of her beautiful little boutique hotel. She was so kind and very fun to talk with. Don't even get me started on the food....it's unreal and sooo inexpensive. The most Steve and I spent on a dinner was $50 which was for 2 huge main dinner plates and 2 cocktails. We ate seafood and meats for under $15 a plate and it was the best food I've ever had in my life. Broccoli burger at Papachos in Miraflores (Lima), Peru. Seafood fettuccine (Octopus, Squid, Shrimp, Scallops) at Pescado Capitales in Miraflores (Lima), Peru. Club sandwich and Causa at Popular in Miraflores (Lima), Peru. Chifa steak and noodles dish (left) and braised short rib in a cilantro based stew (right) at Isolina in Barranco (Lima), Peru.